As many of you know, my family and I are expecting baby number three in just a few short weeks. As I take some time off from work and blogging to spend time with my family both before and after my new son’s birth, I am thrilled to share with you some amazing posts written by some very talented bloggers. So please sit back, relax and enjoy this guest post and leave a comment letting us know what you think! Today we have Miss Speechy from Speech Time Fun here to give some ideas on building language in older children! There are TONS of activities and suggestions out there for promoting language for younger children (preschool, early elementary, and younger). However, there are not as many available to promote language skills in older elementary, middle, and high school students with speech and language weaknesses. Older students need to practice their skills learned as well! Many forget the importance of maintaining skills over the summer with the older population. 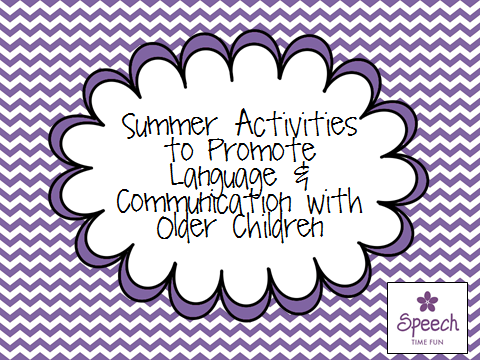 Below I will share some simple ideas to help promote language and communication in a fun and motivating way! Read the comics section to practice understanding humor and figurative language. Predict what the articles will be about based on the headlines and pictures. Practice sequencing and following directions using recipes. Elicit conversations while preparing the food! Practice organizing while going food shopping for the ingredients. Have your students/children practice their written expression skills by documenting all the fun and exciting activities. This way when they return to school in the fall, they can easily recall all of their summer fun with their teachers/classmates. There are a variety of websites that can allow you to create fun puzzles. One of my favorites is by Discovery. You can make puzzles for your children or have them make them for you! Have competitions who can finish puzzles faster or who can challenge the other person best. Have discussions about plans and include your children in those plans! Practice keeping those conversations going!! Miss Speechie, M.S. CCC-SLP is a licensed Speech-Language Pathologist and author of the blog Speech Time Fun. She currently works with elementary students and private clients in a home care setting. Find her on Facebook, Twitter, Pinterest, and TeacherspayTeachers.